Our group decided to focus on 3D printable solutions for items that usually run on electricity as it is commonly not available in disaster relief zones. Our main project this year is designing an incentive spirometer. This would be ideal for situations where lung function has been compromised or is suspected of being compromised. We have specifically designed an inhilation spirometer with three chambers, each requiring an increasing flow rate to raise the ball. This will not only allow doctors to assess lung function, but could also be used as practice for patients trying to improve function. Our second project was the design of a headlight holder which turns your cellphone into a headlamp flashlight. We wanted to take advantage of the fact that all smartphones have a flashlight function and create a way for hands-free lighting for doctors. The incentive spirometer can be printed in four prints: the top, the bottom , the mouthpiece and the three balls. The top and bottom pieces fit together to provide an airtight spirometer body. The decreasing hole diameters from left to right in the top body piece provide an increased flow rate required to lift the ball. Take a slow deep breath IN through the mouthpiece to life the three balls. The device makes use of three 50 mL syringes cut into 120mm length cylinders which can be easily slid into place. Small slits (3 mmx10 mm) are also cut into the bottom of the cylinders. The device makes use of a 15 mm ID respirator tubing that connects the mouthpiece to the bottom spirometer body slot. The incentive spirometer was specifically designed as a means of encouraging you to take a slow Sustained Maximal Inspiration (SMI). The hole diameters were determined through calculations to allow for a flow rate of 600, 900 and 1200 cc/sec in the tubes. The ball in the last tube is the hardest to lift and the design recommends printing this ball in a different colour for better visualization of the goal for the patient. This design allows for a mobile phone to be mounted on someone's forehead to use as a flashlight. The holder is composed of three parts that can be printed together: the forehead mount, the top clamp and the bottom clamp. The forehead mount piece contains slits on the sides and the top to attach the head straps. 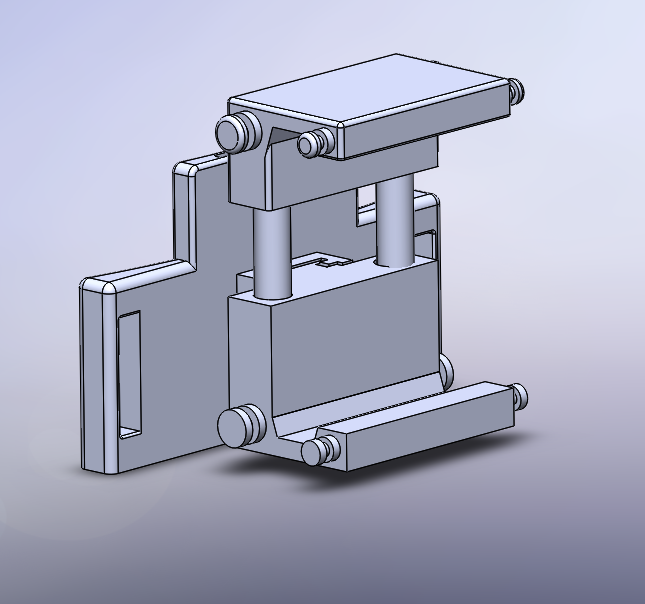 The bottom clamp slides into the attachment piece of the forehead clamp and the top clamp slides into the bottom clamp where it can be adjusted in height. The tightening force is provided by elastic bands that connect to the top and bottom clamp.